Her last film Paulette, released in 2013, was a success in and outside France. 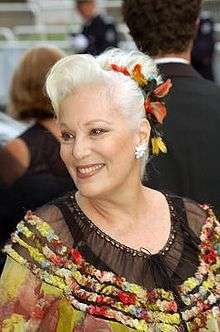 She had three children with her husband Diourka Medveczky: David, Elisabeth and Pauline (1963–1988). ↑ "France: Actress Lafont dies in hospital". euronews.com. 2013-07-26. Retrieved 2013-07-27. 1 2 3 4 "Actress Bernadette Lafont, face of French New Wave, dies at 74". foxnews.com. Retrieved 2013-07-27. 1 2 3 4 5 Snitzer, Barbie (2013-07-25). "Adieu Bernadette Lafont". lemoviesnob.com. Retrieved 2013-07-27. 1 2 3 Naderzad, Ali (2013-07-26). "A French icon dies". screencomment.com. Retrieved 2013-07-27. 1 2 Tartaglione, Nancy (2012-07-25). "R.I.P. Bernadette Lafont". deadline.com. Retrieved 2013-07-27. ↑ Knorr, Katherine (1997-11-15). "Bernadette Lafont:Unwinding the Reels". New York Times. Retrieved 2013-07-27. ↑ "Bernadette Lafont". newwavefilm.com. Retrieved 2013-07-27. 1 2 3 4 5 Bergan, Ronald (2013-07-26). "Bernadette Lafont obituary". The Guardian. Retrieved 2013-07-27. ↑ "Bernadette Lafont Biography". tcm.com. Retrieved 2013-07-27. ↑ "French Nouvelle Vague actress Bernadette Lafont dies at 74". france24.com. Retrieved 2013-07-27. ↑ "Bernadette Lafont". redirectify.com. Retrieved 2013-07-27. ↑ "Bernadette Lafont". screensrush.co.uk. Retrieved 2013-07-27. ↑ "Bernadette Lafont Biography". moviefone.com. Retrieved 2013-07-27. ↑ "Bernadette Lafont Biography". artistdirect.com. Retrieved 2013-07-27. Wikimedia Commons has media related to Bernadette Lafont.